Our VAC Performance & Racing Oil Cooler Kit is an ideal addition to a BMW that sees high performance street or track use, that is driven on a regular or daily basis. Our kit will work great and install easily with your M50, M52, S50us, S52us, S54 (and M54, without the extra mounting tab or by using a OBD1 power steering pump). Includes our VAC Banjo Bolt so no drilling or tapping is required, just bolt on and go. No more risks of a cracked or leaking expensive housing. 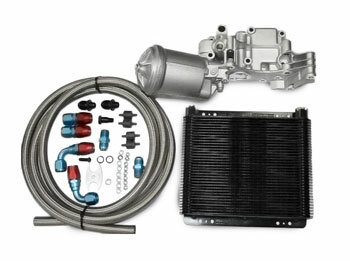 Our most popular, best selling oil cooler kit. For the all out race or max performance street vehicle, check out our Billet style Racing Oil Cooler Kit. The Z3 kit fits the Z3-M cars (with their additional gauges) and has an extra remote oil sensor block that allows you to maintain all the OEM sensors. This block is usually an extra $110 but is discounted 10% when purchased in this kit. From Nathan of Seattle, Washington on 6/6/2009 . VAC Oil Line Adaptor Kit (BMW E36, E46, E9x, F2x, F3x, F8x) – Want to build your own kit? Use this simple part! VAC VANOS Conversion Banjo Bolt, 14mm to 12mm – Our kit includes this awesome bolt! No more drilling or tapping your expensive housing.